A post-16 institution is an institution that provides education or training for those over compulsory school age (which ends on the last Friday in the June of the academic year in which they turn 16). This does not include schools or institutions that are within the higher education sector or that provide only higher education. A parent or young person can name a post-16 institution in an EHC Plan/Statement. However, unless it is defined as a special post-16 institution (sometimes called a post-16 specialist college) under section 41 of the Children and Families Act 2014, there will be no duty on the Local Authority ('LA') to name that institution in the EHC Plan/Statement or for that institution to admit the child or young person. The SEN Code of Practice does not apply to post-16 institutions, other than special post-16 institutions. This means that the provision for those with special educational needs ('SEN') can vary greatly between different post-16 institutions. It is advisable, therefore, that parents and young people visit particular institutions to see if they are set up to deal with a particular type of SEN or disability. 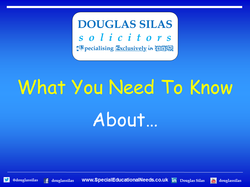 Post-16 institutions are subject to disability discrimination legislation including the Equality Act 2010. As part of this, post-16 institutions are required to increase disabled pupils’ access to facilities and the institution’s curriculum.